With a pref. by Mark Van Doren, and decorations by Valenti Angelo. Bible. O.T. 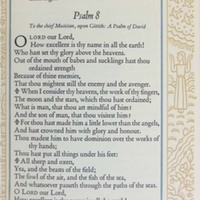 Psalms. English. Authorized. 1960. "The third, in this Twenty-ninth Series of the fine books made for the members of this Club ... The edition has been planned in the fashion of a small illuminated Oriental book by Valenti Angelo ... the illustrations ... look like 'Persian miniatures'; he has illuminated the title spread, by hand, with pure gold. 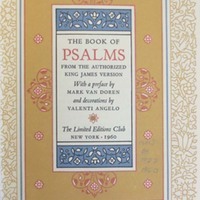 Every page is printed in three or four colors. The text is composed in eleven-point Poliphilus type by A. Colish, who has supervised the printing... The ivory wove paper has been made specially for this edition by the Curtis Paper Company ... 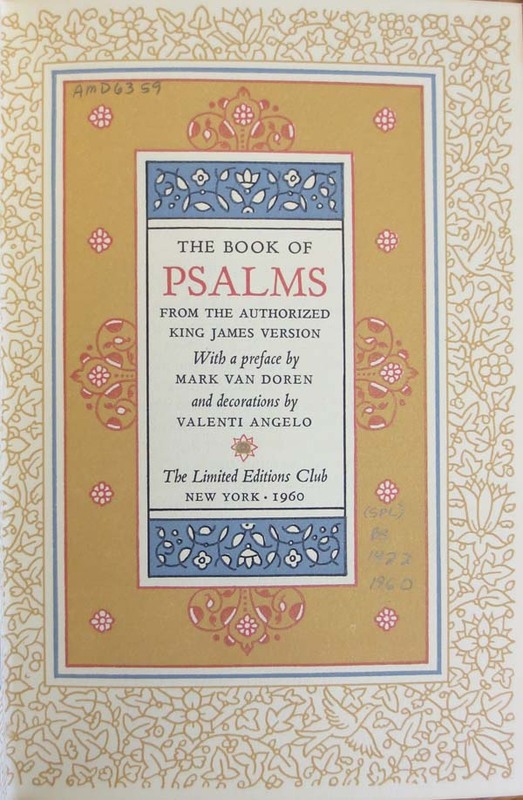 The binding is of genuine hand-boarded morocco [leather], stained the color of a persimmon and stamped with an arabesque pattern from Mr. Angelo. Each copy is placed in a board chemise within its slipcase"--Publisher's announcement. From the collection of Austin Fredric Lutter, with his bookplate. 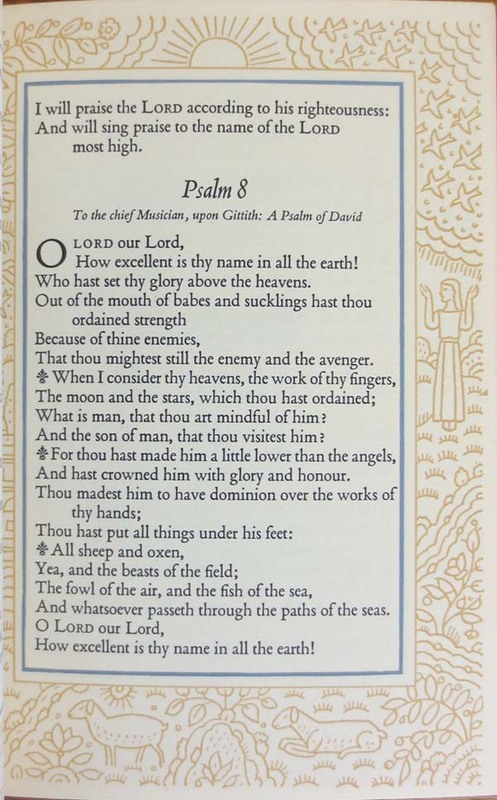 “The Book of Psalms, from the Authorized King James Version,” Digital Exhibits - UWM Libraries Special Collections, accessed April 22, 2019, http://liblamp.uwm.edu/omeka/SPC2/items/show/61.